How is your lower back feeling these days? Raising an anchor by hand can be a real workout, and whether you own a fishing boat, power cruiser or sailboat, a windlass makes boating easier on your back. 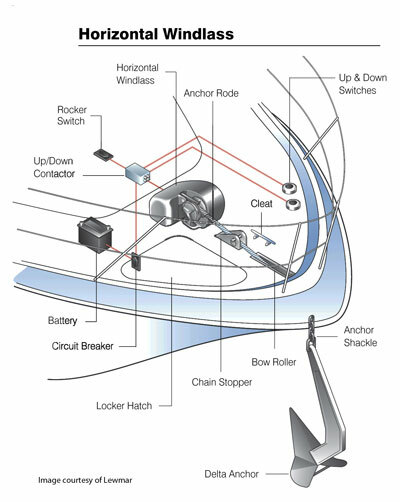 A windlass is the key component in a full-function anchoring system, which also includes a boat’s primary anchor, anchor roller, rode, usually a chain locker, and deck hardware such as a chain stopper or cleat. Windlasses can be DIY-installed by a boat owner with intermediate mechanical and electrical skills. Your choice of the right windlass depends on your style and size of boat, anticipated anchoring conditions, and the weight/type of ground tackle. Many of our customers don’t adequately consider these factors. Read below for some selection advice. What size is your boat? The pulling power or load capacity required of a windlass is hotly debated. Windlasses are not intended to pull a boat against a 25-knot wind and 2' chop with the engine in neutral. They are not designed to break out a heavy anchor under 3' of hard sand. They are designed to weigh an anchor and rode that is not under strain and to provide enough tension to break out a firmly set anchor. But as any text on the subject will tell you, it is the engine’s power that should be used to move the boat upwind and it is the motion of the boat that should break out the anchor—not the windlass. Strain on the windlass should be limited to the hanging weight of the anchor and rode. 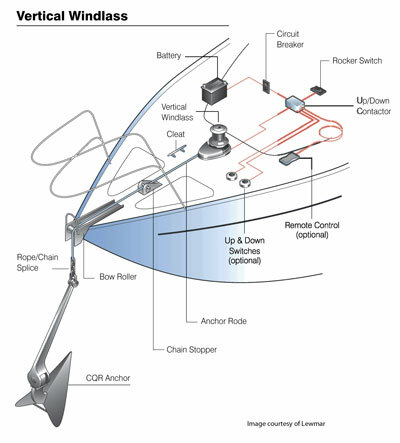 In reality, because many boaters don’t make proper use of their boat’s power when raising the anchor, it is often much greater. Therefore, manufacturers tend to recommend windlasses with hefty pulling power so that you have the capacity to weigh anchor even if your engine is out or it is already running at full capacity or your anchor is firmly stuck. Lewmar recommends that a windlass’s maximum load capacity be four times its usual “working load”—the combined weight of the anchor, rode and hardware. That is, a 33' boat with a 22lb. Delta anchor, 200' of 1/2" rope with 15' of 1/4" chain and a shackle (about 40lb. ), with a total ground tackle weight of 62lb., would select a windlass with at least 248lb. of pull (62lb. of ground tackle, times four). If ground tackle is too heavy or close to the windlass’s maximum pulling power, or if the boat has lots of windage and/or displacement, select the next larger size of windlass. How large is your anchor locker? Measure the depth of the anchor locker to determine the amount of “fall” available (distance between the top of the anchor locker and the top of the anchor rode when it is completely stored inside). This is the most important measurement to help you decide which style to select. Windlasses are categorized as horizontal or vertical. Which style should you choose? Vertical Windlasses are the most popular style, because they have an lower and less obtrusive presence on your foredeck. More of the low-profile unit is hidden below deck and out of the wettest environment. Vertical windlasses generally require a larger hole for the motor, which hangs below the deck. 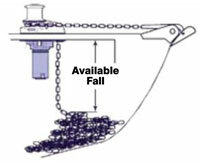 Suitable for boats with larger chain lockers; they often require a longer fall for the chain. The rode makes a full 180° wrap around the gypsy, providing added security, and feeds through a deck pipe to the anchor locker, making a 90° turn. Horizontal Windlasses: most of the self-contained windlass is located on deck. You only need to drill holes in the deck for the chain pipe, wire and thru-bolts. Installation is easier than with vertical windlasses. Horizontal models are good for boats with small or unusually shaped chain lockers, usually needing a minimum fall of only 12". The anchor rode enters the gypsy and makes a 90° turn as it feeds down into the locker. Very large yacht windlasses and most manual windlasses are also horizontal. Side-to-side alignment of horizontal windlasses is critical since they cannot accept rodes leading from off-center angles. What type of anchor rode are you using? All-chain: All-chain gypsies are self-tailing, due to the nature of the chain as it engages the pockets in the gypsy, and are self-stowing, since the weight of the chain causes it to fall through the chain pipe into the rode locker. Many cruising boaters favor all-chain rode. It is highly abrasion-resistant, lies on the bottom in most conditions, and is strong. It is also heavy, expensive, and collects mud. Rope-chain: Rope-chain windlasses use a single gypsy with normal chain pockets on the perimeter and V-shaped grooves in the center to handle rope. This requires that your anchor rope be spliced directly to the last link of chain. This may be a source of concern to some boaters, but tests we’ve conducted have made us comfortable with this approach. Naturally, the splice should be checked regularly for chafe. Rope only: Simple rope capstans let you wrap the rode around a drum and use the electric motor for power. By pressing a button on the deck or windlass case, you haul the rode in by hand the same way you would tail a sailboat’s sheet winch. You’ll end up with a pile of line on deck to coil and stow, and you need to go forward in order to operate the windlass. While helpful when anchors are stuck in the bottom, or when singlehanding in lots of wind, we do not find rope-capstan windlasses to be much of an advantage. Rope-only self-tailing windlasses wrap the line around an internal pulley and deposit it below, and are generally restricted to one or two sizes of three-strand anchor line. You are limited to a length of chain that does not exceed the distance from the windlass to the anchor roller, generally a few feet or less, which we think is inadequate for most rodes. 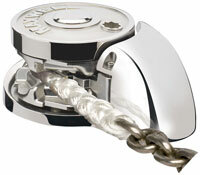 Maxwell RC12-10 vertical windlass uses a Wave Design™ gypsy that fits High Test, BBB or Proof Coil chain. Other windlasses need careful matching between rode and gypsy. Is the gypsy compatible with your rode? It is very important to match the windlass not only to the boat type, but the type of rode as well. This applies to both the size and the type of the chain, so a windlass gypsy designed for 5/16" High Test chain will not work on 5/16" BBB, which has shorter, more compact links. Many windlasses have a selection of gypsies, which can be Special Ordered to fit the existing rode on a your boat. Do you want remote operation? 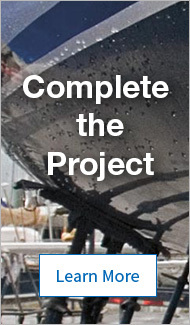 Finally, determine whether or not you want to be able to operate the windlass from a remote location. Sailors commonly weigh anchor from the bow, but on many powerboats it may be inconvenient to operate the windlass from the bow. On any boat it may be unsafe to stand on the deck in rough weather. Deck-mounted foot switches, located near the windlass, are useful even if remote operation is not desired. Panel switches at the helm are popular on powerboats, and handheld remotes (either wired or wireless) can be used on sail or powerboats when remote operation is desired.